토수란 지붕의 추녀나 사래 끝이 비바람에 부식되는 것을 막기 위해 끼우는 용머리형의 기와이다. 높이 30.5㎝, 길이 35.2㎝의 이 토수는 목 부분을 방형으로 절단하고, 그 속을 비워 나무를 끼울 수 있게 하였고, 나무를 고정시키기 위해 못 구멍 좌우에 각각 2개씩 뚫었다. 전체를 도금하였으나 현재는 대부분 탈락되었다. 용은 눈을 크게 부릅뜨고 있으며, 뭉툭한 윗이빨이 아래입술 위로 돌출되어 있다. 코는 짧게 처리했고 약간 불거져 나온 눈동자를 2단으로 만들어 생동감 있게 처리하였다. 눈 위로 돌출된 눈썹은 각을 이루며 끝부분을 뒤쪽으로 흩날리듯 뾰족하게 조각하였다. 이마 정수리에 높게 솟은 뿔은 뒷쪽으로 길게 뻗어가다 끝부분이 앞으로 둥글게 말린 고사리 형태를 하고 있다. 금동용두토수(金銅龍頭吐首)는 안압지 금동제 용두나 경상북도 영주 출토 금동용두보당과 비교하면 사실적인 면이나 역동감이 부족한 느낌이 든다. 세부장식 표현이 생략되었고 코가 짧고 뭉툭하여, 용보다는 거북이 머리에 가깝게 표현된 점에서 통일신라 또는 고려 초기에 만든 것으로 생각된다. Tosu is an interior ornament that covers the wooden portion of a roof to increase its durability and prevent wear and tear from heavy rain and strong wind. This one is 30.5 cm high and 35.2 cm long. The neck area is cut to a square shape and then a hole is made and a piece of wood inserted. To fix the wood, two nail holes were made on each side of the hole. The whole area had been plated, but most of the plating has come off over years. The eye of dragon is open wide, while its stubby upper teeth stick out over the lower lip. The nose is short and to make the dragon look alive, the pupils are made rather reddish and divided into two parts. The eyebrows sticking out above the eyes are bent backwards at a sharp angle while the tips of eyebrow are dancing in the wind. The two horns rising high from the forehead extend far backwards and roll up like bracken at their tips. 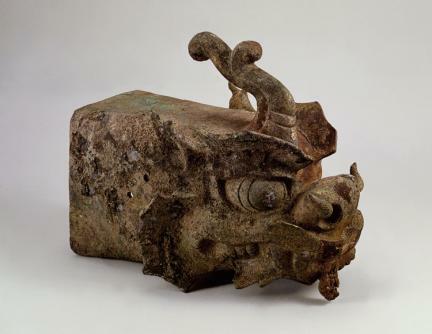 Compared to gold-plated dragonheads found in Anapji Pond and another site in Yeongju, Gyeongsangbuk-do Province, this piece is inferior in both artistic quality and dynamics. 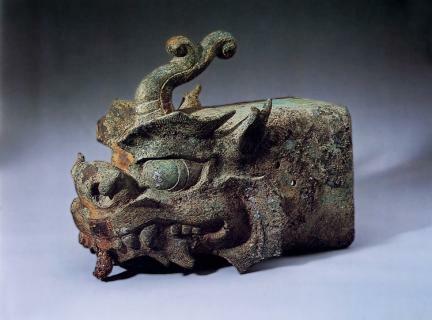 The details of its ornaments are abbreviated and the nose is short and broad, making it look more like the head of a turtle than of a dragon. It can be presumed from the evidence that this was produced from the period between the last days of Unified Silla and the beginning of Goryeo Dynasty.